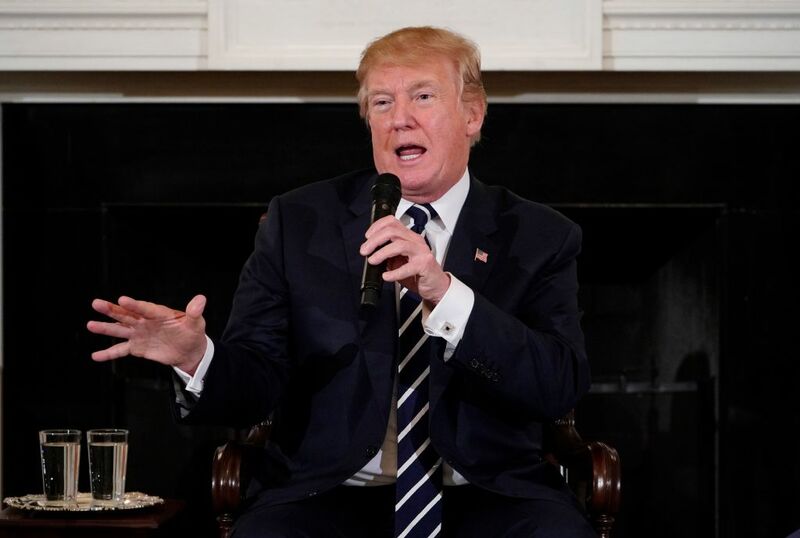 At both the listening session at the White House and the CNN Town Hall this week with victims of mass shootings, a troubling theme arouse when legislators and NRA spokespeople were asked about what could be done to curb gun violence in schools: arm the teachers, an idea floated by President Trump himself. Immediately, every rational, change-oriented person in the world responded by saying that arming teachers is the worst idea if we as a country want to end gun violence. Despite that, some states are already considering bills to require teachers to carry a firearm. But it’s not just implausible and dangerous, arming teachers also puts more guns out there in the world, which is precisely the thing people, on both sides of the political spectrum, want to stop. It’s also exactly what organizations like the NRA would like to see more of. On Thursday, Donald Trump tried to clarify his terrible idea in a series of feverish tweets. He wrote that he never said to “give teachers guns” (even though he did), but that he wanted to look at the possibility of giving “concealed guns to gun adept teachers with military or special training experience — only the best. 20 percent of teachers, a lot, would now be able to immediately fire back” at a “savage sicko.” His idea is that “highly trained teachers” with guns would make a gunman reconsider shooting up a school knowing that there were teachers with guns ready to stop them. “Attacks would end,” he concluded. But law enforcement representatives, teachers, students (in addition to anyone thinking clearly) all feel like this would be a terrible idea and only make the situation worse in the long run. Here are a few reasons why they’re right, just in case it’s not achingly obvious. 1Teachers are supposed to teach. i paid for two trumpet cases out of pocket this year because we didn’t have 40 dollars to spare to buy them, but you can give me a glock? give me a break. What the country is mourning right now is the idea that an entire generation of students have been raised to consider going to school a potentially dangerous situation. It’s just not clicking for some people that the Parkland students leading the way right now in this nationwide discussion about school shootings are so well informed and pissed off precisely because school has become a conflict zone. Arming teachers only exacerbates that situation at at time when we desperately need to be alleviating it. Teachers and students spend enough time running through active shooting drills. Kids are taught how to spot the signs of a classmate who might be dangerous and told to report them, when what they should be doing is daydreaming about whether they’re going to run into their crush in the cafeteria. Teachers go into teaching to teach. If they wanted to learn how to load a gun and take out one violent threats, they would have joined the Army or become a police officer. Teachers are already used and abused by our education system. They’re not paid enough, have to bring in their own supplies, are burdened with sometimes restrictive curriculum requirements…all things that get in the way of them actually doing the one thing they signed up for: teach, not disarm the troubled student who was able to buy an AR-15 over the weekend. 2Teachers are not always good people. Teachers are humans, too. Although most of them are wonderful people who want to make sure their students succeed and know the basics about how to critically think and work out a complicated math problem, others are not as great. Arming teachers is the same thing as arming any civilian – those guns could easily be used for anything but defense and defeats the purpose of creating a safe space in school. Knowing your teacher had a loaded firearm in their desk instead of all the cell phones they confiscated during homeroom is scary and not conducive to fostering a safe learning environment. The frazzled teacher is a stereotype that’s often true due to their low pay, overcrowded classrooms, and too many responsibilities other than teaching already. Beyond that, they’re human and susceptible to mental health problems as much as any student. And even if they were some “elite” teacher that Trump’s imagining, a gun in a classroom could easily end up in the hands of a kid who wanted to use it on their classmates or even a younger kid coming across it by mistake. (It happens in the homes of responsible gun owners all the time.) It’s too risky. 3Carrying a firearm is not the same for everyone. Of course, someone would say that maybe the firearms are all locked up in the school at the end of the day so no one has to carry a firearm to and from work, which, in states with open carry laws, one could safely assume that an armed teacher would be able to do. But the idea still falls very short. Armed civilians aren’t all treated the same, as is best evidenced by Philando Castile, a teacher with a gun in his car, who was murdered by police during a traffic stop. 4More guns is not the answer to this problem. Saying that we should arm teachers is akin to that old NRA argument that “good people” with guns can stop gun violence. They can’t always. Requiring more guns in schools or turning our teachers into marksmen totally misses the point. What we need are less guns everywhere and to make encountering one, whether it’s at school, a movie theater, or in a church, a thing that civilians don’t have to worry about. Arming teachers is akin to shrugging our shoulders and saying, “well, this is the new normal” instead of getting to the root of the problem, which is the fact that there are too many guns accessible to way too many people. Full stop. We want schools to be safe for kids and not feel like an active conflict zone. Giving teachers guns isn’t just impractical, it will only end up being another talking point the next time a school shooting happens. Right now we blame “mental illness” or law enforcement for not doing their jobs for these preventable tragedies. Giving a teacher a gun only gives lawmakers a way to pay lip service to “solving” the gun epidemic and still take their sacred NRA campaign money. It also gives the NRA another scapegoat — “The teacher didn’t know how to shoot to kill!” — the next time a mass shooting happens, when really, guns and this collective obsession with arming people is the real problem. Don’t get sidetracked by thinking that arming teachers is the solution. It’s just another distraction.